Transcatheter valve therapy (TVT) has emerged as a growing new treatment option for patients with valvular heart disease. TVT is the featured core of the Structural Heart Disease Summit; and the landscape of TVT is rapidly evolving, with the maturation of Transcatheter Aortic Valve Replacement (TAVR) and rapid ascension of transcatheter mitral and tricuspid therapies. A common theme has been the integration of non-invasive cardiac imaging, surgical experiences, heart failure expertise, and novel transcatheter approaches as part of a multidisciplinary heart team for the diagnosis and planning of optimal treatment in patients with complex valvular heart disease. Importantly, structural heart disease is a burgeoning new subspecialty fueled by many other clinically important transcatheter procedures, led by left atrial appendage (LAA) and patent foramen ovale (PFO) closures. TVT, the Structural Heart Summit, now in its twelfth year, is designed for a multidisciplinary audience of clinical practitioners, healthcare professionals, academicians, engineers, and scientists – including clinical cardiologists, cardiac imaging specialists (especially echo and CT), cardiac and vascular surgeons, electrophysiologists, heart failure specialists, nurse practitioners and physician assistants, cath lab technicians, other healthcare professionals, and members of the medical device community who are interested in valvular and structural heart disease. TVT will provide a comprehensive review of the best clinical practices in the management of valvular and structural heart disease (including LAA and PFO closure therapies), including in-depth coverage of less invasive transcatheter devices currently in clinical use or under investigation. Live Cases by Expert Operators … Twenty live case demonstrations of transcatheter aortic and mitral-tricuspid valve interventions, as well as LAA and PFO closures, from six renowned US and international sites. Vital Training Opportunities … Interactive and hands-on physician workshops at the Training Pavilion, including trans-septal techniques, MitraClip, imaging for TVT guidance, and new TAVR technologies. Image-Guided Therapies With Case-Based Learning … Enhanced image-guided therapy workshops with clinically-relevant case presentations and interactive discussions, plus unique “Bioskills” sessions on cardiac anatomy and transcatheter procedures with integrated echo and CT imaging and virtual reality. 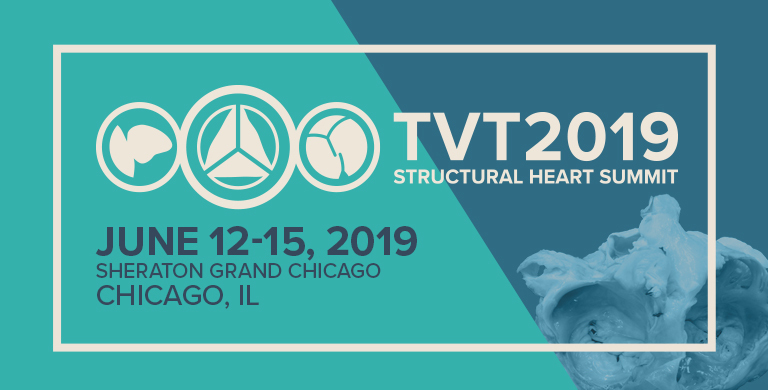 Innovation … A new TVT and Structural Heart Innovation Symposium intended to uncover and present the next generation of early stage technologies. Chance to Share Your Research … Challenging cases, moderated posters, and late-breaking science submissions provide an opportunity for interventionalists everywhere to join the TVT faculty. Rich Didactic Content … Comprehensive and robust didactic content with an emphasis on clinical practice, including main arena state-of-the-art and clinical controversies, new technology forums, topic-based workshops, and cased-based tutorials. Hot Topics … Special sessions, including a Cardiovascular Team Professionals Symposium, a joint US and Japan TVT collaboration session, and a Structural Heart Fellows Forum. The Cardiovascular Research Foundation is accredited by the Accreditation Council for Continuing Medical Education to provide continuing medical education for physicians and by the American Board of Internal Medicine to provide Maintenance of Certification (MOC) points. The Cardiovascular Research Foundation designates this live activity for a maximum of 25 AMA PRA Category 1 Credits™ (subject to change). Physicians should claim only the credit commensurate with the extent of their participation in the activity. It is the policy of the Cardiovascular Research Foundation (CRF) to ensure balance, independence, objectivity, and scientific rigor in all of its sponsored educational activities. Commercial support from industry does not influence educational content, faculty selection, and/or faculty presentations, and therefore, does not compromise the scientific integrity of the educational activity. Discussion of off-label product usage is made at the sole discretion of the faculty. Off-label product discussion and usage are not endorsed by CRF or the conference directors of this activity. Faculty participating in continuing medical education activities sponsored CRF are required to disclose to the activity audience any real or apparent conflicts of interest related to the content of their presentations. Faculty not complying with this policy are not permitted to participate in this activity.